Saturday, May 4, 2019 at 1:00 p.m.
Elizabeth “Betty” Barrett Watson, 70, of Topeka, passed away on Sunday, April 7, 2019 with her children at her side. She was born January 25, 1949 in New York City, the daughter of Richard Francis and Edna (Zahn) Barrett. She resided in Topeka since 1971. At the time of her retirement, Betty was employed by the State of Kansas. Betty graduated from St. Clare Academy, Hastings-on-Hudson and Katherine Gibbs School, New York. After graduation, she worked at the United States Youth Council in New York where she met her husband-to-be, Terry Watson from Osborne, Kansas. Betty and Terry were married on December 5, 1970. He preceded her in death on August 22, 1982. After their marriage, Betty and Terry moved to Topeka where Terry practiced law with McCullough, Wareheim and LaBunker from 1970 until his death. Betty and Terry were proud members of the Democratic Party. They worked together and independently on the campaigns of many Democratic candidates at the national, state, and local levels. Additionally, they shared a passion for civil rights, social justice, and workers’ rights. Betty and Terry had children and grandchildren who survive: David Watson (Sheri Deeter) of Seaside, California and Melissa Watson (Carl Wiederaenders) of Des Moines, Iowa, and their sons, Nicholas and Benjamin. Betty was a voracious reader particularly of mysteries and literary fiction. Some of her favorite authors were Josephine Tey, Isabel Allende, Henning Mankell, and Gabriel Garcia Marquez. She loved the vibrancy of the Topeka and Shawnee County Public Library where she checked out books and DVDs of her favorite old movies and frequently had lunch or coffee with friends. Betty was also an art lover, especially art created locally. She attended art fairs in Topeka and Lawrence and treasured most those paintings related to a story she heard from the artist. Weekly trips to the Topeka Farmers' Market on Saturday mornings were a special time for Betty. There she chatted with vendors and friends while gathering goodies and plants. She was an avid flower gardener and you could mark the arrival of spring when beautiful pots of flowers appeared on her patio and in her yard. Living in the same house for 45 years, she was a fixture in the neighborhood. 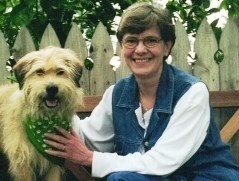 She connected with neighbors and shared her indomitable sense of humor with them as she walked Bear, the family dog, and later in succession her dogs, Jack, Bobby, and Teddy. Betty left behind a community of devoted friends in Topeka and beyond. Ken Peterson, Betty’s long-time friend and companion, preceded her in death on February 19, 2019. Her family will hold a memorial service for Betty at 1:00 p.m. Saturday, May 4, 2019 at the Unitarian Universalist Fellowship of Topeka. Private inurnment will take place in Memorial Park Cemetery at a later time. In lieu of flowers, memorial contributions may be given to the Friends of the Topeka & Shawnee County Public Library, 1515 SW 10th, Topeka, Kansas 66604 or to Helping Hands Humane Society, 5720 SW 21st, Topeka, Kansas 66604. Dove Southeast Chapel, 2843 SE Minnesota Ave. is assisting the family. Add your memories to the guest book of Elizabeth Watson. I am so sorry for your loss. My thoughts are with you at this difficult time. David and Melissa, I remember the good times with your mom and dad with great fondness. My own political grounding began with them. They were contagious; it was almost like going to class at your home. Angel and I regret the passing of your mother and hope your own memories will forever bring you peace. We will greatly miss having Elizabeth next door. I met her shortly after we became next door neighbors in 2013. She was a wonderful neighbor: always friendly and generous. She insisted on paying me entirely too much for mowing her tiny yard. We appreciated having her next door and she leaves a hole in the neighborhood. We are unfortunately unable to attend her memorial service as we have a familial commitment that day. But we trust that her loved ones will understand that we wish we could be there and that we extend our deepest condolences.